This Fresh Fossil: They Did WHAT?! It's Spring Break! So this week I've decided to dig up some of my favorite tutorials, horror-stories, and remodels from the archives to share again with you. Enjoy! In between all of our other projects, big and little, that we've been doing, I've been doing something else. And no, it's not landscaping. 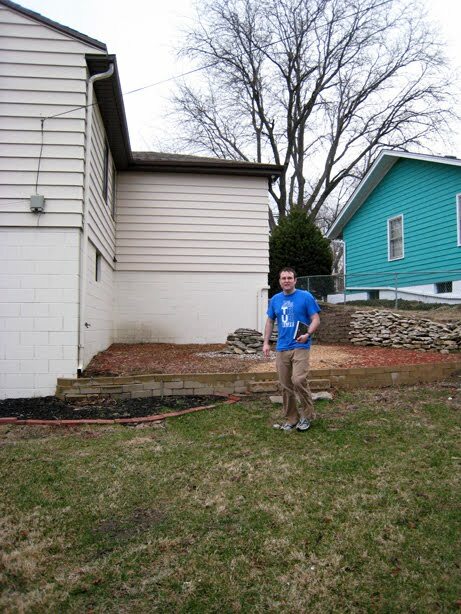 When we bought the house, there was a raised area full of dirt and mulch, and topped with a homemade fire pit in the backyard. We didn't think much of it at the time, except that it struck us as a bit odd. The odd raised area when we viewed our to-be home. 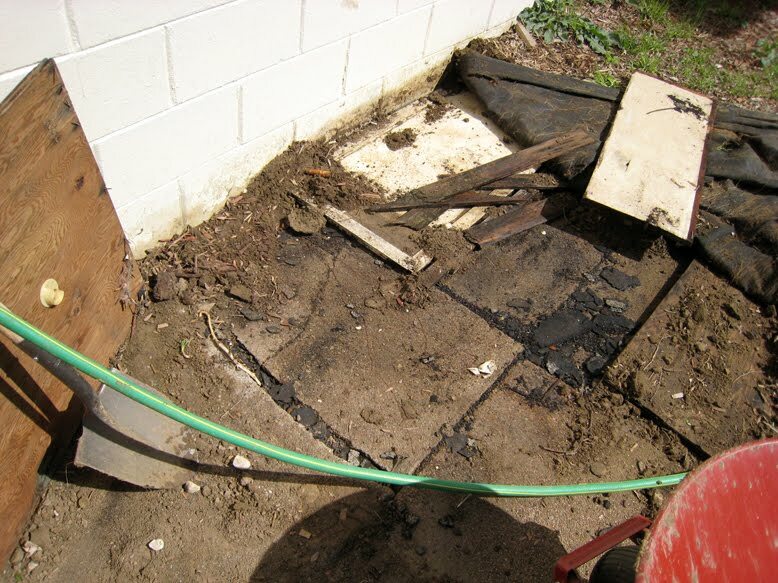 Until the previous owner showed up one day and unloaded a truckfull of dirt on top of the patio. That was one of our biggest "They did WHAT?!" moments. Sort of right up there with disguising a shower as a linen closet and proudly telling us that they had "updated" the kitchen by installing brand new carpet in there. Yeahhh. 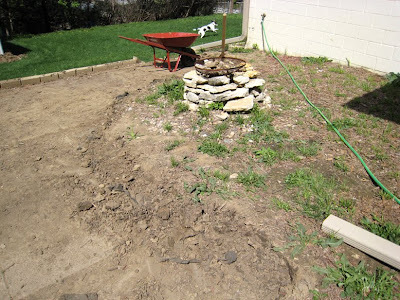 The same day that we learned of what was said to be underneath the inches of dirt, weeds, mulch and river rock, we then grabbed a shovel and started digging. And guess what? Yup, our friendly neighbor was right. 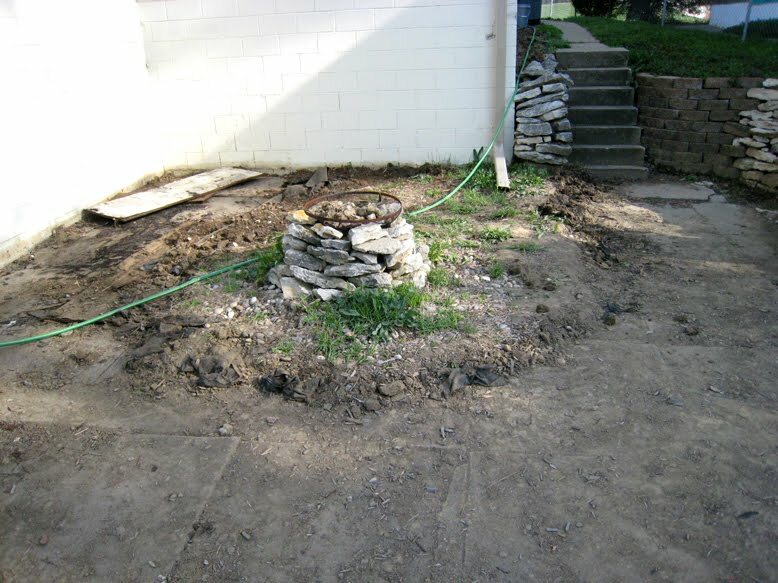 There is indeed a nice, albeit old, concrete patio under all that earth. Granted, so far the slab pieces are a little uneven in a few spots along with a few gaps, but nothing too major. 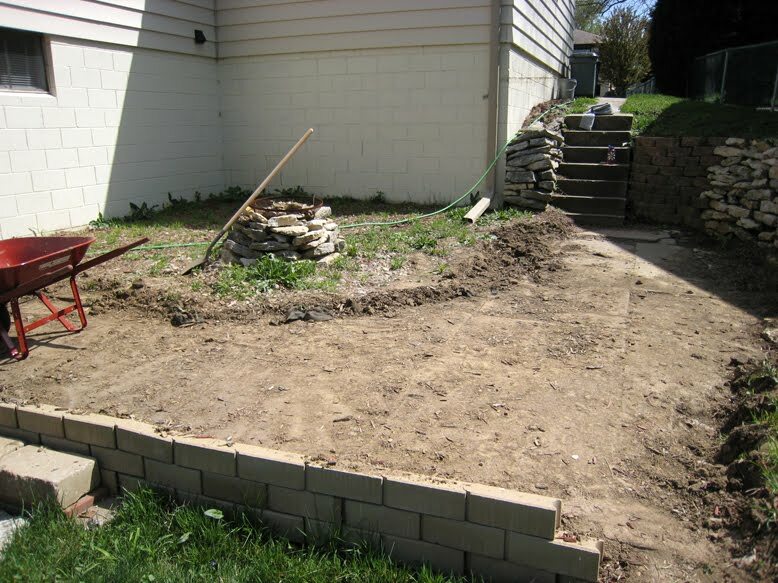 Nothing major enough to warrant covering up with inches of dirt, which inevitably turns into a glorified weed garden. We've found that they thought ahead and even put weed block down - underneath the dirt and mulch, right over the concrete. Heaven forbid those pesky cement weeds grow, by golley! I spent 8 hours digging up part of the patio on Saturday. Oh, and guess what else I found under the mulch, rocks, dirt and weed block? 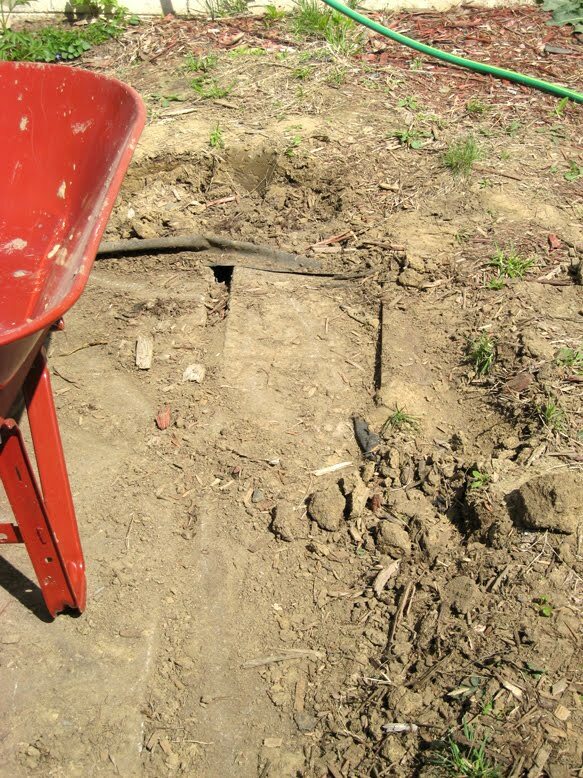 I was digging along, and instead of the constant scraping "tink tink" noise of the shovel hitting the cement (muffled a bit by the lovely weed block, of course), I heard something entirely different - a soft "thud thud" noise. 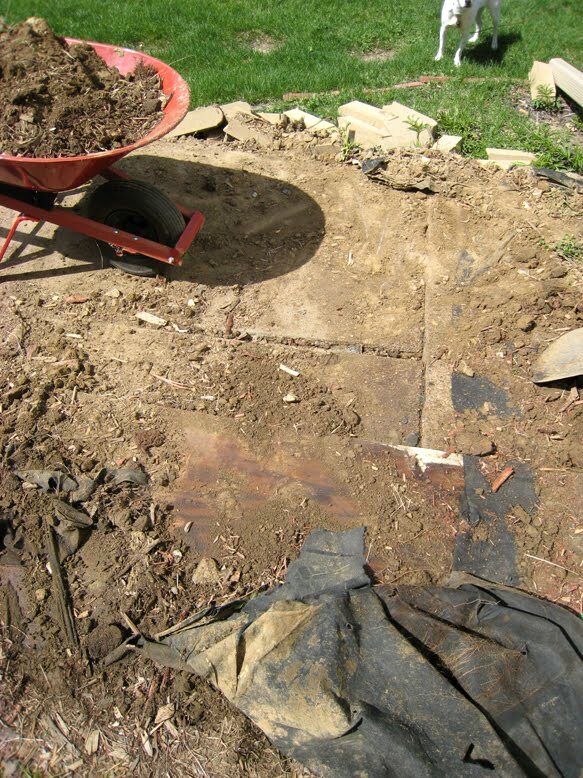 I won't lie, the first thought that crossed my mind was that there was a coffin buried under there; that the previous owners had commited homicide and tore up a section of patio in which to place the coffin, and then covered everything up with a truckfull of free dirt they scored for free off of Craigslist. Nope, it was garbage. And no, not your average garbage consisting of Taco Bell hot sauce and taco wrappings, like what we found tastefully tossed on our lawn on Monday morning when we woke up, causing me to briefly consider buying a camera to catch the culprits the next time they throw trash on our street. Not that sort of trash, but old wooden doors, wooden scraps, plywood, part of what looks like maybe a shower door or something. With rusty nails sticking out of it. Have I mentioned yet that the previous owners' name is now an expletive in our household? Tearing out the carpet in the kitchen - "Ack, CHARLIE!". Discovering the hidden shower: "Gosh Darn it, CHARLIE!". Finding asbestos in the basement: "Ahh, CHARLIE!" 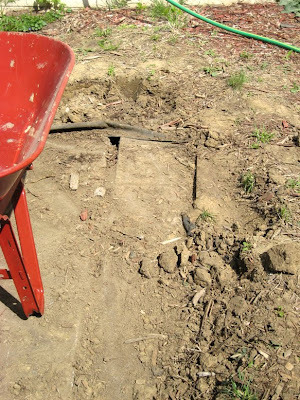 Every backbreaking shovel full of dirt - "Grr, CHARLIE!" Finding wooden trash buried on top of the cement patio: "CHARLIE, CHARLIE, CHARLIE!" My progress after 8 hours on Saturday. 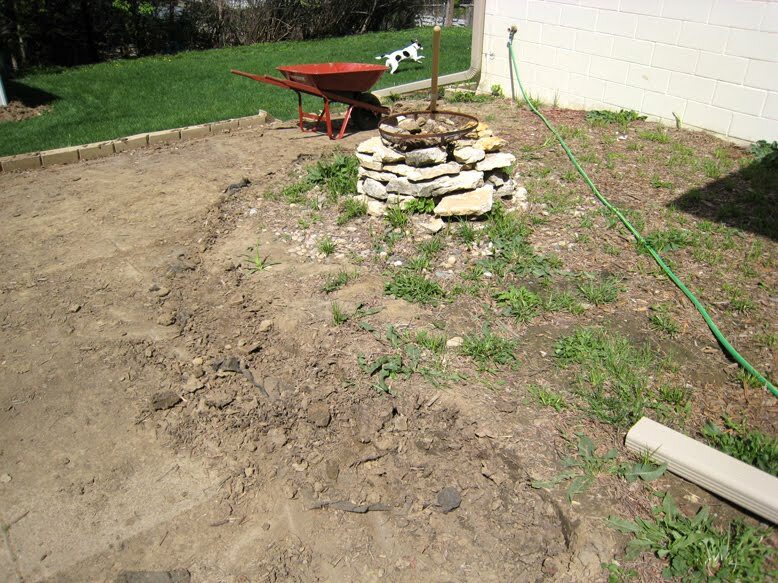 So one of our other big projects is to finish digging up and unearthing our buried patio. What? Doesn't everyone have one of those in their backyard? And if you do, does yours come with complimentary wooden antiques? I'll bet my bottom dollar it's not nearly that cool. Or something. *Snort* I remember this well, and your total shock as across blogland you became a celebrity for it. Where ever you're basking, I hope you heard me chortling with glee.